In a freaky twist of adventure, some of the favorite Monster High ghouls get accidentally fused together. Prepare to see the original tribe of beast ghoulfriends like you've never seen them before! Choose from Lagoonafire (a mix of Lagoona Blue and Jinafire Long), Dracubecca (a fusion of Draculaura and Robecca Steam), Cleolei (a combination of Cleo de Nile and Toralei), Clawvenus (a blend of Clawdeen Wolf and Venus McFlytrap) and Neighthan Rot (a unicorn-zombie boy). 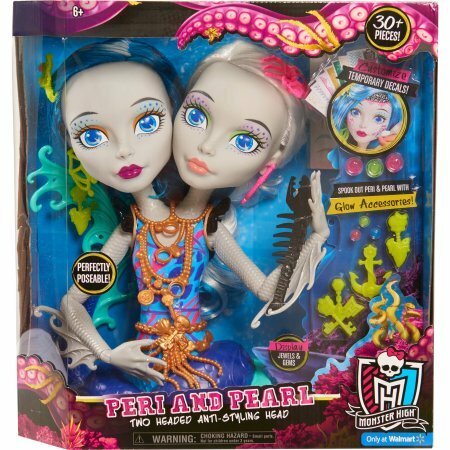 Each freaky fabulous doll offers twice the freaky flaws along with killer "fusionable" style. Accessories include a to-die-for purse for each - except Neighthan Rot, who has a hat with a hole cut out for his unicorn horn. Each also comes with a doll stand and brush, plus a personalized diary that contains scary cool insights into these clashing dual personalities. Collect them all to expand the fun to monster proportions. Each sold separately. Ages 6 and older. 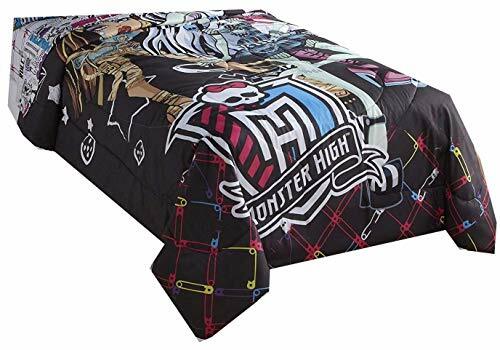 This fun Mattel Monster high all ghouls allowed twin/full 72x86 inches comforter features Frankie Stein, clawdeen Wolf and draculaura on a multi and black ground. 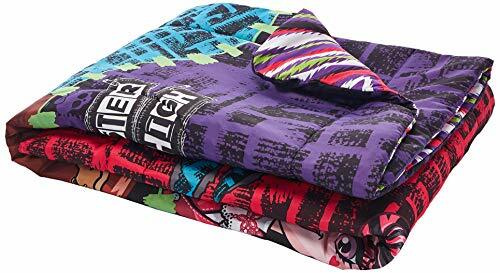 Made of 100percent polyester microfiber. Machine wash cold, use non-chlorine bleach if needed. Tumble dry low, remove promptly. Do not iron. The ultimate skel-ebration of monster mania, this year's Monster High dance will be the monster bash to end all bashes (if it happens)! And as the Monster High ghouls make new beast friends, the horror show really begins. This freaky fabulous new character is larger than unlife at 17 inches tall! And of course, she wears an over-the-tent fashion with lots of freaky flair! Girls will love recreating scenes from the episodes or telling tall tales of their own. 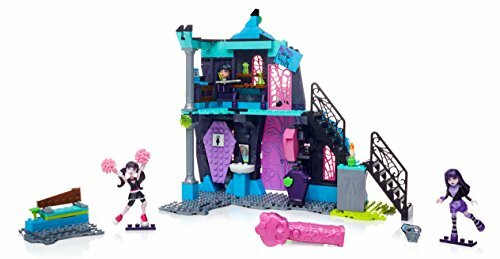 For over-the-tent excitement, collect all of the Monster High Freak du Chic dolls (each sold separately). .
You never know what you’ll find in the School Fang Out by Mega Bloks Monster High, but Draculaura and Elissabat are determined to find out! Build the sprawling school and discover all of the school’s secrets using the skullette blacklight to reveal five spooky symbols on the walls! After class, the ghouls open their lockers to pick up their iCoffins before heading to the bathroom to frighten up. Then, they’re off to the lounge to text each other — but don’t let Headmistress Bloodgood catch them, or they’ll be called up her office on the second floor! Too late, Bloodgood is calling for the ghouls with her microphone! Good thing you can hide the iCoffins in the lounge’s secret storage area before ‘heading off’ upstairs! Fang out with the coolest ghouls in school and discover all the surprises and transformations lurking the halls of Monster High! Ideal for ages 8 and up. At 17 inches tall, this Monster High doll is larger than un-life! Fans will recognize a favorite core character in her signature outfit with hugely monsterrific details. Clawdeen Wolf doll, Daughter of the Werewolf, looks fashionably fierce in her classic purple and animal print and topped with a sleek jacket with “fur” collar. Uhhh-mazing accessories, like her to-die-for peep-toe boots, are inspired by her unique scaritage and killer style. Capture the large-scale ghoul in scary cool poses, or play out freaky flawed tales. The 17-inch doll comes with a doll stand to capture a memorable moment. 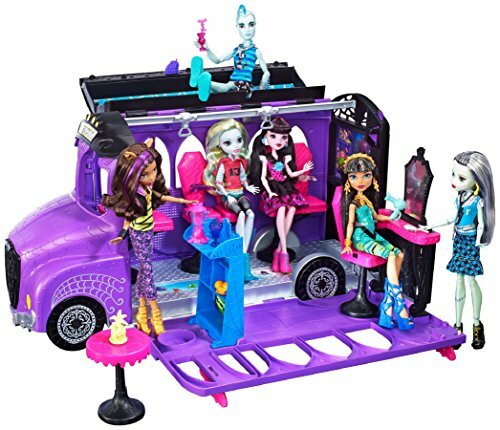 Collect her ghoulfriends to build “up” your Monster High world (each sold separately). Colors and decorations may vary. Monster High Creeperific Coffin Beauty Locker over 60 Items!